Hudson Denney has just handed me perhaps the most memorable bite of BBQ I’ve ever had. It’s beef brisket; tender as a poem by Byron, more complex than a fine Bordeaux, redolent with spice, smoke, acid, sweetness, and cherry wood overtones. Hudson can tell I’m impressed by my wicked smile. I’ve been coming to the NC BBQ Championships for ten years, and I always leave with a distinct memory of something wonderful. If Hudson were serving this at a fine dining restaurant, diners would be barging into his kitchen to offer up kisses and accolades. Unfortunately, at this particular venue, he won’t finish in the top ten. And I knew this as soon as I tasted his brisket. 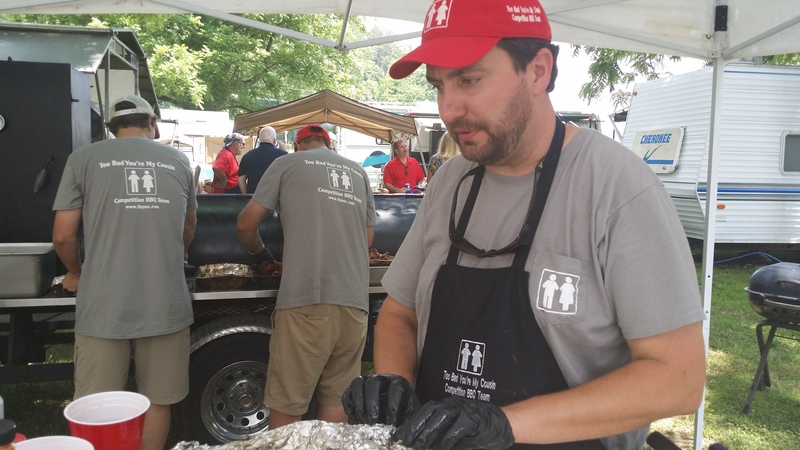 The judges might be impressed but they won’t consider it as sufficiently representative of North Carolina barbecue. 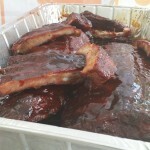 At last year’s event, I was fortunate enough to taste first place ribs and brisket, and I was completely underwhelmed. Last year’s winning barbecue was very good, very tender, properly seasoned and well-balanced. And it was also safe. If you asked me to describe it, I’d be stumped to offer any details. Hudson’s brisket will stay with me for a very long time. Hudson Denney contemplates his brisket. My next stop was Tiger O’Rourke of Henry’s Barbecue. As far as a BBQ success story goes, Tiger is it. He’s been a part of Greenville’s iconic Henry’s Smokehouse for almost as long as they’ve been open. He started as a dishwasher in 1991 and now is a partner. Henry’s is the sort of BBQ joint that displaced Southerners pine over. They’ve got a real wood burning pit, mounds of succulent pulled pork, lots of pretty smiles behind the counter, Cole slaw made with Duke’s mayonnaise, and sweet tea that flows like a tapped fire hydrant in summer. Henry’s also has a food truck, a catering service and customers lined up out the door. 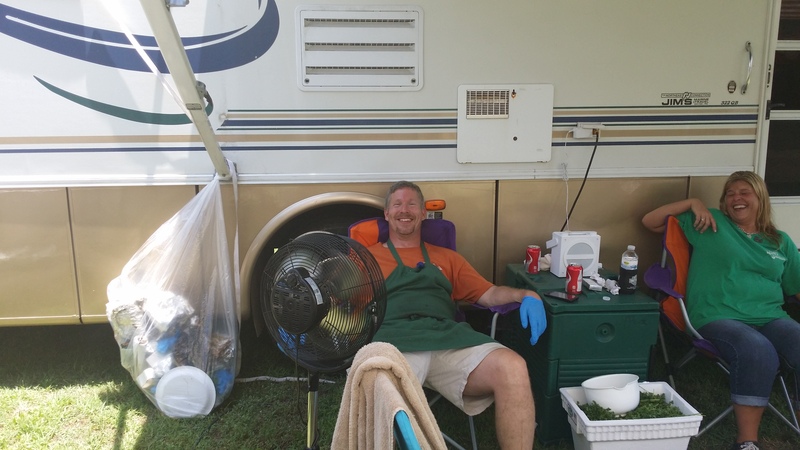 I’ve talked to a lot of BBQ competitors over the years and most of them have the same dream. They want a bricks and mortar BBQ joint, much like Henry’s. Tiger’s brisket is wonderful. He hasn’t swung for the fence like Hudson has. He’s taken the safe route and giving the judges what they’re looking for and he’s done an admirable job. 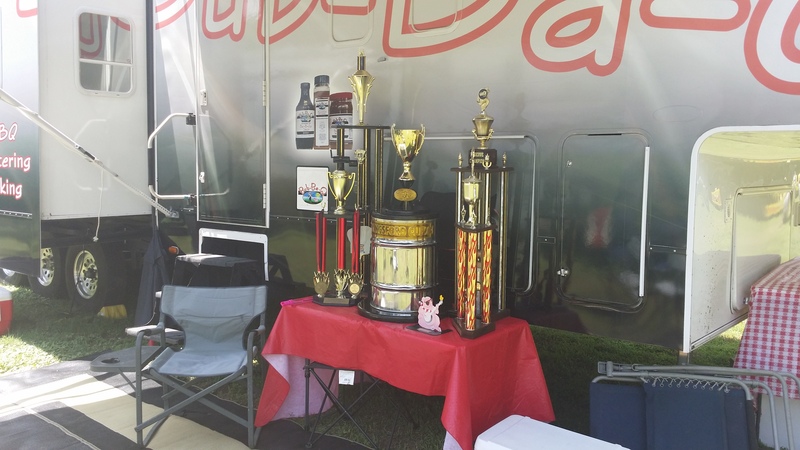 But there’s 75 other teams here and some of them sport multiple Grand Champion trophies. Tiger knows what he’s up against and he’s not happy with his brisket. He pronounces it too dry, perhaps a bit tough. Understand that this is beef brisket an average backyard BBQ’er would practically swoon over. But against some pretty serious competition, he knows it isn’t going to win him any trophies. His brisket has been on the smoker since the early morning hours and there’s little he can do at this point, so he offers me a beer. 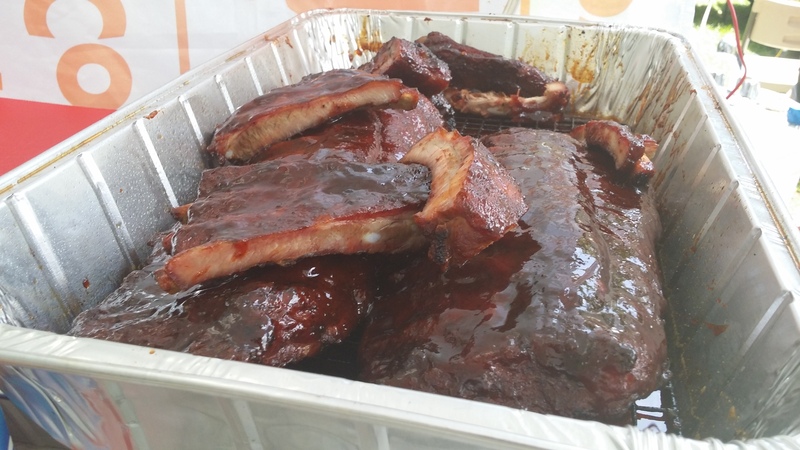 Each competitor has to prepare chicken, pork ribs, pulled pork and beef brisket, place a small amount in a standard Styrofoam go-box and it gets hustled to a table of six judges who may disqualify an entire box just for pooled sauce. After Hudson hands me a bit of his brisket, one of his teammates shakes his head and labels the beef “incestuously good.” I’m not prepared to pass judgment on that statement. But I do know the brisket it’s not going to fly with the judges. 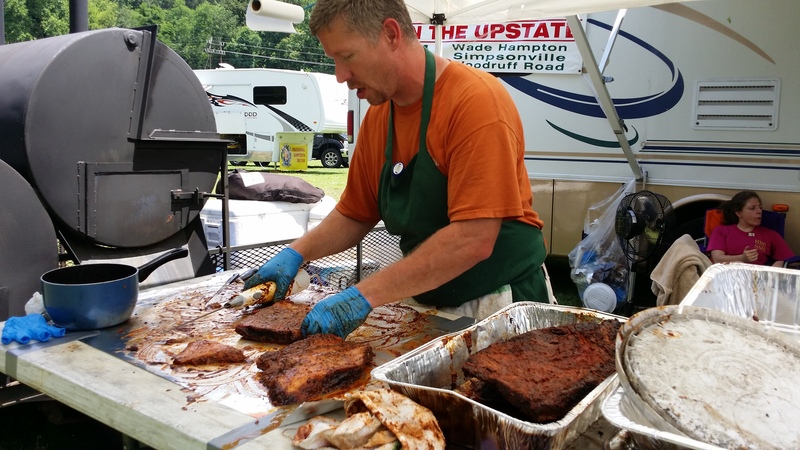 Competition BBQ has grown exponentially in the last ten years and that means bigger purses, more attention, and more competitors. At this particular event, Food Network and Travel Channel both made an appearance. 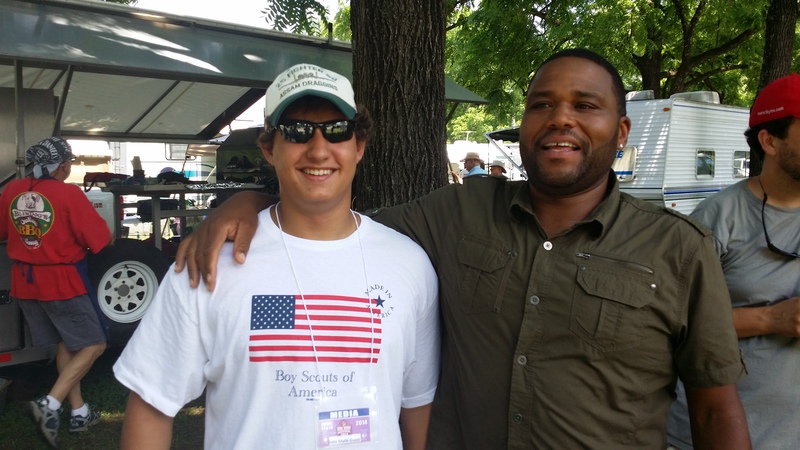 Anthony Anderson stood still long enough to harass my son, Tudor. There’s writers, BBQ aficionados and various hangers-on, all wandering through the competition area, all hoping to taste award-winning pork. But this sort of event isn’t for the faint of heart, or wallet. Most of these teams practice for weeks, they take notes, carefully select their wood, carefully measure brines or spice rubs, alter their cooking style to suit their judges, then practice, practice, and practice some more. And all this practice is time consuming. And expensive. And at the end of the day, you may be beaten by the narrowest of margins or by a boatload of points. And at the end of the day, neither Tiger nor Hudson finished in the money, yet they are both successful in world class BBQ.